If you lived through the ‘90s, you probably haven’t had your fill of the phenomenon that is Kurt Cobain and his life’s work. Last year’s documentary Montage of Heck seemed to prove that at least the controversy surrounding Cobain’s death still seems relevant to a whole lot of people. Even for the marginal fans, it’s hard to resist the cult of worship that revolves around the celebrities from our youth—the genuine rockstars who sparked movements (however unclear the aims of those movements were) and helped define what music is and is capable of—especially the tragic ones. But exactly what kind of worship fueled the obsessive endeavor that is Robert Fitterman’s experimental book Nevermind (Wonder, 2016) isn’t exactly clear. With Nevermind, Fitterman (author of the book-length poem No, Wait. Yup. Definitely Still Hate Myself, an accumulation of dejected blog- and online posts) “repurposes” the seminal Nirvana album Nevermind by laying out the entirety of the album’s lyrics, word-for-word, over the course of 712 pages, leaving out punctuation and capitalization, to present the album like lines of poetry—as “poems,” in a manner of speaking, that minimally contain an average of one-to-ten words a page, so that the lyrics of the opening track, for example, the grunge anthem “Smells Like Teen Spirit,” sprawl languidly across the book’s first 67 pages. Song titles are also redacted from the text, so that each song leads uninterrupted into the next. The book is void of any other surrounding text—no foreword, not even an author bio—the effect of which, combined, is, well… open to interpretation. Clearly some level of obsession is necessary in the act of compiling and deconstructing an album’s lyrics, in the act of laying these lyrics out methodically, intently, sparsely over the course of a tome that, physically, reaches David Foster Wallace-like proportions (it’s a large book). But why this album? Likewise, it would take a risk-loving press like Wonder to see such an indulgent endeavor through—Wonder being the publisher, for example, of Kate Durbin’s E! Entertainment: a pink-paged, vivid, detail-oriented observational account of a series of reality TV’s most noteworthy episodes—The Anna Nicole Show, Real Housewives, and so on. To contrast, Kate Durbin’s version of obsession seems focused on interrogating the cult of worship surrounding society’s fixation on fame and materialism, on examining a brand of ugliness that has been inflated with value. Durbin’s lack of overt intellectual framework might make the book seem almost tragi-silly, like a dark joke—if its smart, glittering descriptions weren’t still so compelling, didn’t lure us right back in to the trap of voyeurism. 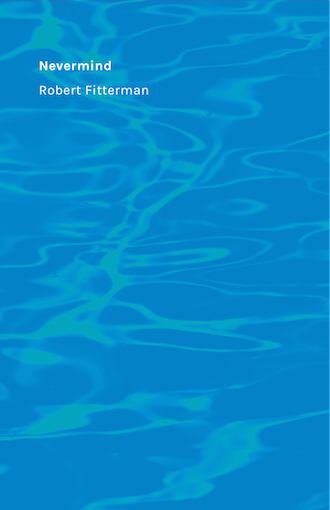 But Fitterman’s obsession with Nevermind seems more playful, and also more provocative, reminiscent of the way that Conceptualism’s most visible poet/non-poet Kenny Goldsmith’s “Printing Out the Internet” might be described as both playful and provocative—not to mention, a waste. Consider the thousands of trees sacrificed for this art—art that already exists in other forms. As we know, Conceptualism has gained a lot of attention lately for becoming the literary stage for crossing lines: Kenny Goldsmith, Vanessa Place, The Mongrel Coalition have gained uncharacteristic visibility within the poetry realm for their offensive and extremist tactics. One might consider whether Fitterman’s playful act might also be construed as another Conceptual ploy for attention, an attempt to get a little piece of the spotlight—in this case, by capitalizing on the interests of loyal fans—whether his is just another empty gesture reflective of a society that is itself increasingly empty, a mirror held up to a vain subject. On the other hand, as I said, it seems we haven’t had our fill of Cobain-the-phenomenon in much the same way we haven’t even begun to have our fill of the internet. Maybe there is still a void to be filled. Maybe there’s something in the act of carving out a physical space for those things that otherwise exist only ephemerally—like worship, fandom, the time we spend online, the time we spend listening to music, the slow or quick accumulation of culture—that’s sort of irresistible—even if that space is something most people will only understand as a cluttered office in Mexico, or a few square inches of occupied shelf. It’s possible the urge behind Nevermind, the book, or in the distressingly impossible act of “printing out the internet,” in reaching out of the confines of one medium into another, is one of the many reasons art exists. I admit, there’s something immediately exciting, pleasurable, in these lyrics being bestowed with such physical heft, in lifting the literal weight of those words in my hands, and seeing with my eyes that which is already infused with my own childhood head-banging, sweat-smelling memories, in paying attention. Perhaps 700 pages aren’t even enough when you consider the way music was transformed by these songs. Well, it can feel like an affront. I’m speaking on behalf of those fans who have spent days, years, pouring over these lyrics, listening to the songs ad nausuem in an effort to pierce through the layers of meaning and glean a sense of the drive behind them. These lyrics belong to them. To them, the music, the lyrics, the songs, the movement, are sacred—and to take from what has already been done, and done with such accuracy, what stands as a kind of perfection, is appropriative, sure, but also maybe curtailing, capitalistic—things Cobain seemed spiritedly against. As a side note, those who have invested time and research into understanding the Cobain phenomenon will probably also be wondering where Fitterman got the lyrics to “Endless, Nameless,” the last song included in the book, and a limited, secret song on the album, since definitive ones were not provided by Cobain himself. I have to say, I respect the level of skepticism presented by these points of view. It comes from a kind of love and devotion to music, and to the art that music can be. And again, unlike Durbin, who at least lends the focus of her attention and her own original descriptions to her work, Fitterman’s love is not as clearly written into the pages of Nevermind—his opinion on the music is left out. In fact, in an interview Fitterman says he’s “indifferent” to his choice of subject. (The cover, then, feels like a depiction of this emotional distance: a digitized approximation of the amniotic image we know.) And his absence of criticism accompanying the book is no accident. In The Believer, rather than answer questions, Fittermen elects to interview a reader about his (critic Paul Stephens’) interpretation of the book. Fitterman’s first question to Stephens is, “What did you initially make of this book?,” which, one might fathom, could imply that the book is itself is posed like a series of questions: “What does this endeavor do for/to you? How does it make you feel?,” etc.—and by extension, “How does the music make you feel?” The interview quickly develops into an account of Stephens’ experience listening to Nirvana in his youth—a personal relationship to music, once again alluding, in a way, to some additional purpose that art might serve: to spur emotional reactions, to ask questions, to remind us of things worth remembering. I guess what I’m ultimately saying is that, with the obvious exception of the belligerently racist acts of certain Conceptualists, there must still be a place for that which the publishers of Nevermind have optimistically classified as “wonder,” a place for artists to indulge, a place for the Stein-lovers of the world to parse fancifully and manifest statements like “reading word by word makes the writing that is not anything be something,” and “I really do not know that anything has ever been more exciting than diagramming sentences,” (two endearing things Stein is reported to have said). For some, Nevermind, in its seemingly simple task, will manage to offend; for some Conceptualism in itself has already managed to become offensive, as it often relies on cultural appropriation and flirts with copyright infringement (hi, Courtney). Fitterman does not refute the proprietary nature of the book. It would be pointless to do so. The book falls in line with the contemporary Conceptual act of stealing, which might just depend on what’s being stolen and from whom. For me, I find it’s just nicer in this case to hold potentially opposing ideas in mind, to consider the arguments situated around this book in its complicated context— important, even, in this historical context, to ask these kinds of questions of art and of Conceptualism in particular. But it’s still possible to appreciate Nevermind as a simple art object: a large book that holds the lyrics to some songs I love, that plays, that worms into my brain and makes a familiar sound there as I flip through it’s pages—a kind of magic.